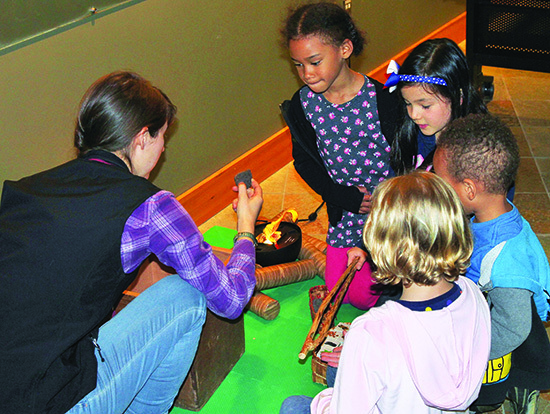 It was a much busier than normal morning for the Hibulb Cultural Center as many visitors, from young kids to elders, stopped in on April 5 to take advantage of a new opportunity to get up close and personal with cultural objects, artifacts and traditional items. Learning more about Tulalip and other tribes in the Pacific Northwest was made possible by the BurkeMobile and its helpful program educators. BurkeMobile is a traveling program that brings Burke educators and real museum objects to learning environments across the state. Program participants are able to investigate the cultural heritage of local tribes through hands-on activities that stimulate curiosity and model new ways to learn. A highly appreciated program created by Burke Museum, located on the University of Washington campus, BurkeMobile was created specifically to stimulate learning about accurate Native culture. 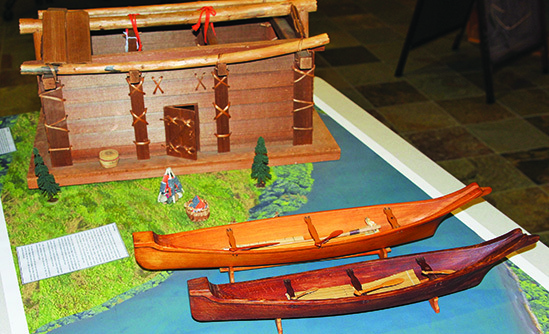 The program has included Native voices in its creation, such as collaborating with Hibulb and adding a mock Hibulb Village with accompanying miniature longhouse and canoe display. Over the two-hour window BurkeMobile was available, many Hibulb visitors, especially the youth, were engaged with the hands-on materials. They saw how cultural practices can grow and change over time from generation to generation and learned about the diverse, local Native culture. Burke educators were more than willing to answer any questions and offer insights into various subjects, just like they do when traveling to schools. 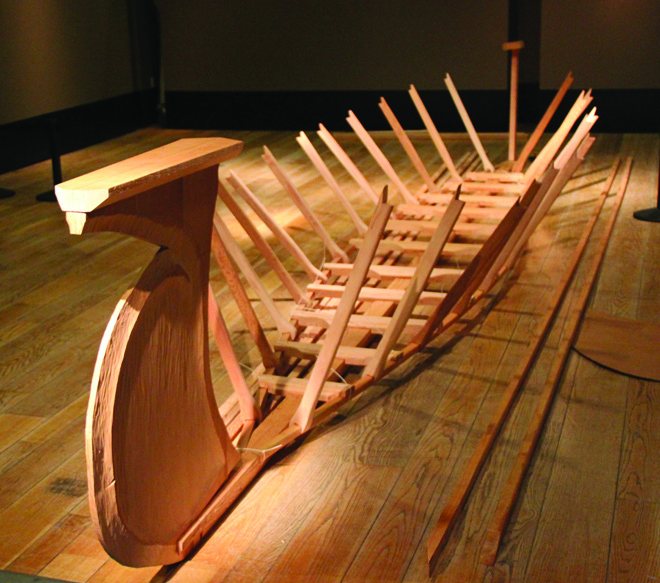 The model Angyaaq, which means ‘open boat’ to the Sugpiat peoples of Alaska. The Burke Museum, located on the University of Washington campus in Seattle, is home to more than 16 million historical artifacts and objects. The thing is, only a few thousand are on display on a daily basis. 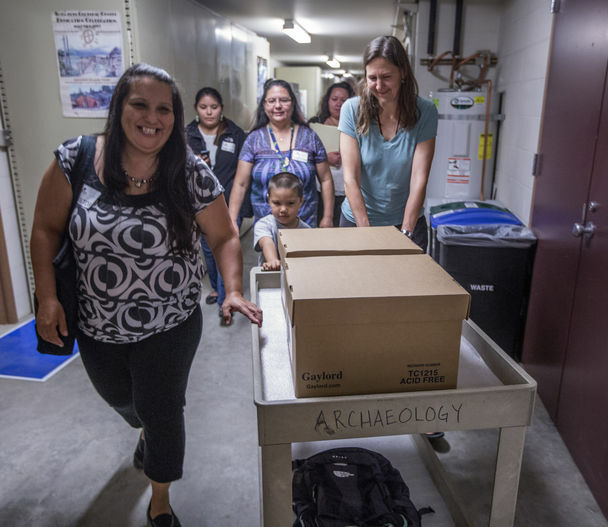 Of those millions and millions of artifacts hidden away in archives and storage rooms, there is no telling how many hold cultural keys that could unlock indigenous knowledge once thought lost or destroyed forever during colonization and European settlement. Enter Dr. Sven Haakanson, member of the Alutiq people of Kodiak, Alaska. Sven is a world renowned curator of North American ethnology and currently the head of Native American anthropology at the Burke Museum. Sven has joined the Burke team to use the museum’s amazing collection and vast resources to find those keys to indigenous knowledge currently hidden away. A prime example of rediscovering indigenous knowledge that was thought lost forever has been the finding of simple model boat. Well, it was thought of as simple and sat away in collections until Sven came across it and realized he had stumbled across long lost knowledge. What he found was a model Angyaaq, which means ‘open boat’ to the Sugpiat peoples of Alaska. This model Angyaaq is one of only a dozen known to exist and hold secrets to a long ago mode of transportation. It demonstrates a lost building tradition, models the difference pieces needed, and material and engineering techniques used to build a full-size Angyaaq – like marine animal skins to wrap the hull and lashing to tie all the pieces together. 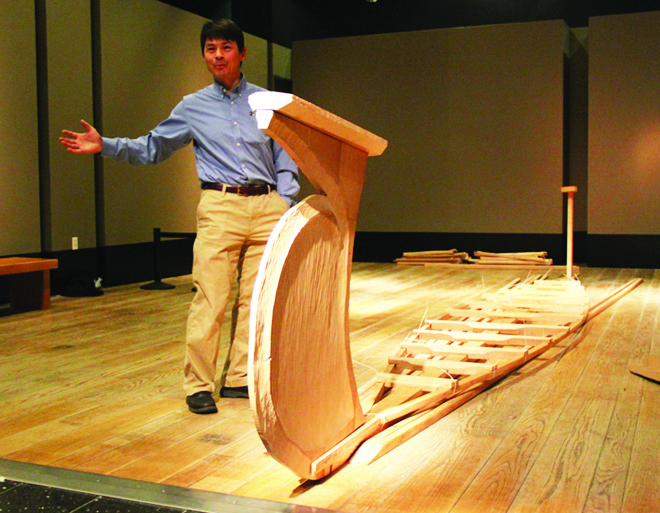 This model is key to Sven unlocking and reviving a practice of boat making absent on Kodiak for nearly 200 years. According to Burke researchers, the Angyaat (plural for Angyaaq) were an essential part of the Sugpiat peoples of Southern Alaska’s livelihood and culture for thousands of years. An open boat used for transportation, hunting, trading, warring and more. Angyaat were a symbol of prosperity and wealth. Remnants of these boats are present in archaeological sites; yet, by the 1820s, roughly twenty years after contact, Russian settlers had either taken or destroyed all Angyaat in an effort to restrict the Native peoples’ ability to move, gather in large numbers, and display their wealth and power. Due to this destruction, very little is known about a type of boat once common on Kodiak Island. What Sven set out to do was first make successful models of the model, in an effort to teach himself how to build the open boat without the use of modern methods. “No nails, no glue” in order to replicate and then teach the traditional way. After many intricate sketches and even more attempted models later, Sven had taught himself how to replicate the Angyaaq model using the same traditional techniques. The next phase is to use the model to build a full-size, working boat. Over the summer, Sven will travel to Kodiak Island to work with tribal members on the construction of several model Angyaat, with the goal of training students how to build a full-size, working boat in the future. Practicing this reconstruction with community members is helping share Sugpiat heritage and traditions, restoring knowledge that’s been lost, and providing a research model for others around the world to emulate. Until then, Sven with continue to hone his Angyaat building skills as he hosts a live exhibit that can be witnessed by all. Witness the revival of a lost practice as part of a special month-long program at the Burke Museum. Visitors can see the finished Angyaaq in the Maker-Market from December 20 – January 3. Check burkemuseum.org/maker for the up-to-date boat construction schedule. Tulalip News visits the Burke Museum, and so should you! 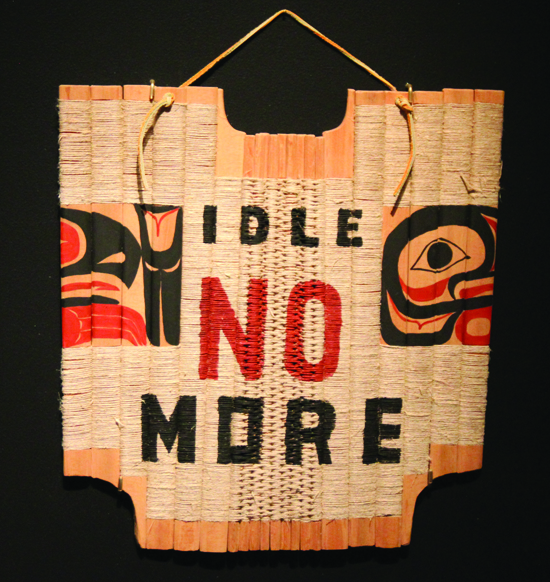 The Burke Museum, located on the University of Washington campus in Seattle, is currently showcasing their Native American artwork exhibit Here & Now: Native Artists Inspired. The exhibit is on display through July 27, 2015. Here & Now showcases how today’s artists learn from past generations. According to Burke curators, the exhibit features 30 new works by contemporary Native artists, paired with historic pieces from the Burke Museum that artists identified as key to their learning. Over the past ten years, the Bill Holm Center for the Study of Northwest Native Art at the Burke Museum has awarded grants to over 90 artists and scholars providing access to the Burke Museum’s collections. To gauge the real-world effects that their grants had on recipients, the Burke contacted each of their grantees and invited then to share how their artistic practice was affected by their study at the UW. Many of the grantee artists conveyed messages about how new pieces they had made were inspired by the historical artworks they had come into contact with at the museum. Each artist identified one key piece that influenced them, which are now on display next to each artist’s modern day interpretation of the artwork. “It’s great to go and study the old pieces, to look at them, and hold them. You feel the energy. You can’t get over the quality, the detail, in the pieces. They’re some of the best teachers you get,” explains Latham Mack, Bill Holm grantee and Nuxalk artist from an Indigenous First Nation in Canada. The Burke made the statement: Ours is a working collection, serving artists and scholars who forge connections with these artworks to maintain a continuum of knowledge and creativity that spans the generations. For more information about the Burke Museum, including daily hours, admission costs, location and directions, please visit www.burkemuseum.org or call Burke Reception at (206) 543-7907. 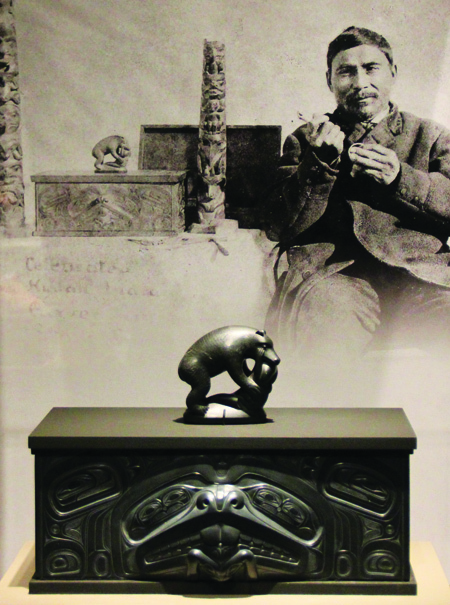 The mask in on display at Seattle’s Burke Museum through July 27, 2015. Everyone in the Pacific Northwest is a Seattle Seahawks fan these days. And why shouldn’t they be? The Seahawks (11-5) took the NFL by surprise in 2012 with their rookie quarterback Russell Wilson, beating Washington in the Wild Card Playoffs, and narrowly losing to Atlanta on a last second field goal. In 2013, the Seahawks (13-3) rampaged through the NFL enroute to a dominating Super Bowl Championship over Denver. The 2014 Seahawks (12-4), again finishing as the #1 seed in the NFC, made it back to the Super Bowl after the miracle comeback against Green Bay. In the Super Bowl, Seattle coach Pete Carrol unleashed the beast Marshawn Lynch on 2nd and goal from the 1 yard line….oh, wait. Well, we all know what happened. But do you know the origin of the Seahawk’s logo? In case you weren’t aware, there is actually no such thing as a seahawk. Ornithology experts, people who study birds, theorize the term ‘seahawk’ refers to a combination of an osprey, which is a bird of prey native to coastal North America, and a skua, which in our area we normally call a seagull. So if there isn’t an actual ‘seahawk’ found in nature, then where did the inspiration for the Seattle Seahawks’ logo come from? The general consensus is that in 1976 the NFL commissioned a logo for the newly-formed Seattle Seahawks. The designers were inspired by Northwest Coastal art, specifically something known as a Kwakwaka’wakw (pronounced: KWA-kwuh-kyuh-wakw), also called a transformation mask depicting an eagle in its closed form with a human face inside. They found an image of this mask published in Robert Inverarity’s Art of the Northwest Coast Indians. According to curators at the Burke Museum, long before the Seahawks took the field at the old Kingdome, this mask played an important role among the Kwakwaka’wakw of Vancouver Island. Transformation masks like this one represented rights owned by individual chiefs, often depicting origin stories of an individual family or an ancestor’s super-natural encounters. When this mask is danced in ceremony, a pivotal moment in the song calls for the mask to be opened, revealing the face of a man inside. Carved in the late 19th century, the mask was purchased by Fred Harvey Company before 1910 and later came into the collection of Max Ernst. Ernst, Picasso, and other Surrealist artists were fascinated by the aesthetic power of Northwest Coast masks, which they saw as direct expressions of human instinct and unconscious thought. After Ernst’s death in 1976, the mask was acquired by a private collector, William P. Palmer III. Eventually the Palmer collection came to be displayed in Maine’s Hudson Museum in 1982. The mask had been on exhibit in past years, but had always been shown in the open position, so its similarity to the Seahawks logo was concealed. 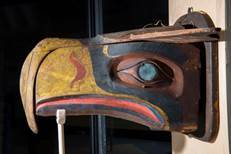 It wasn’t until early 2014 that the mask’s whereabouts even came to the attention of Seattle’s Burke Museum, located on the University of Washington campus. In September 2014, the Burke launched an online fundraising campaign to bring the mask to Seattle. It didn’t take long to raise the money needed to conserve, insure and ship the mask across the country. Today, the mask is on loan to the Burke Museum as part of its newest exhibit, “Here & Now: Native Artists Inspired”. You can see the mask that inspired the original Seahawks logo while it’s on display through July 27, 2015. A tag in the mask dated 1910 includes a catalog number from the Fred Harvey Company, which operated hotels, restaurants and Indian marketplaces throughout the southwestern U.S. in the late 19th and early 20th centuries. The company’s collectors traveled throughout the southwest, California and along the Colorado River buying art for the marketplaces. 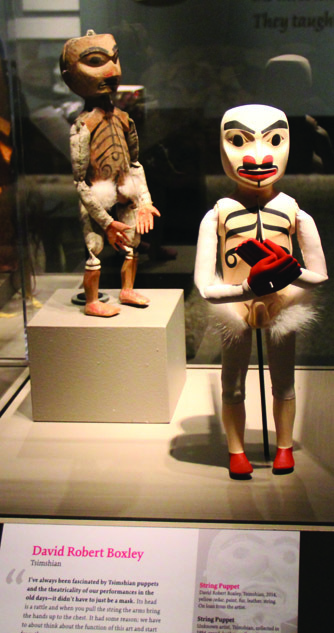 They also collected objects from Plains and Alaskan tribes, which offers a possible explanation for how the mask came to be part of the company collection. The Seattle Seahawks logo is inspired by a Kwakwaka’wakw artist’s mask which will be on display at the Burke Museum in Seattle on November 22. The Kwakwaka’wakw mask that inspired the Seattle Seahawks logo will be on display next week. The mask, which is more than a century old, was created by an artist or artists of the Kwakwaka’wakw community and will be on display on November 22 in the Here & Now: Native Artists Inspiredexhibit at the Burke Museum in Seattle. 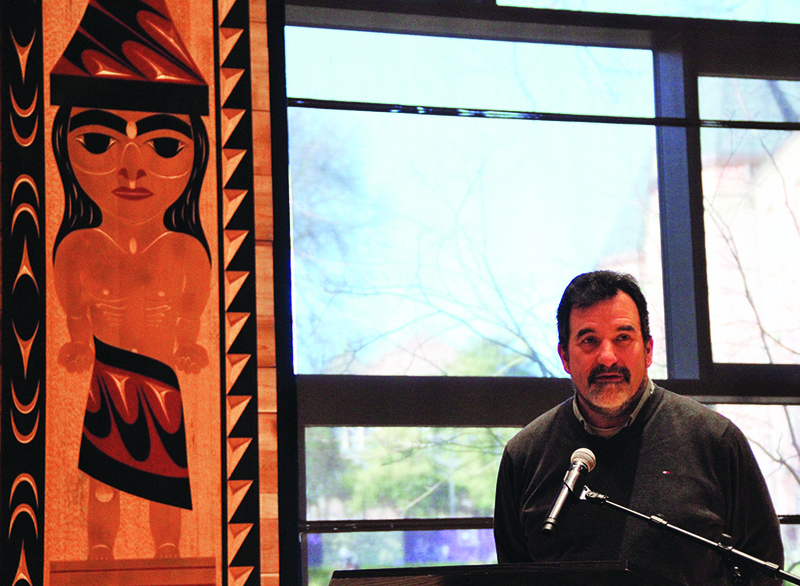 When the mask arrived in Seattle last month, Bruce Alfred, Namgis Band of the Kwakwaka’wakw Nations, provided information to the museum to be used in its display. “It’s very old, and a beautiful piece,” Alfred told The Seattle Times. Alfred also said that more than one artist might have designed the transformation mask since it was used by a dancer in ceremony who made adjustments to it for fitting purposes. On Monday, The Seattle Timesreported that the online campaign to bring the mask to the city reached its financial goal, raising more than $22,000 from at least 450 donors. Its goal was to raise copy4,575. The museum had planned to undertake the cost, but the fundraising on KickStarter.comand other donations made that unnecessary. Kwakwaka’wakw community members, the museum and representatives from the Seattle Seahawks, including alumni players, Seattle Sea Gals, and Blue Thunder will welcome the mask a few days earlier with a ceremony and photo op on November 18, as well as sneak peak of the new exhibit. The event is not open to the public. The mask is two-feet long and about three-feet wide when it opens; and it weighs at least 5 pounds. Seattle— Northwest Native artists create 30 new works inspired by 200 years of history. Here & Now: Native Artists Inspired features work by artists whose practice has been informed by the objects in the Burke’s collections, demonstrating how today’s artists and art historians learn from past generations. The exhibit will include contemporary works in a variety of media alongside the historic pieces that artists identified as key to their learning. 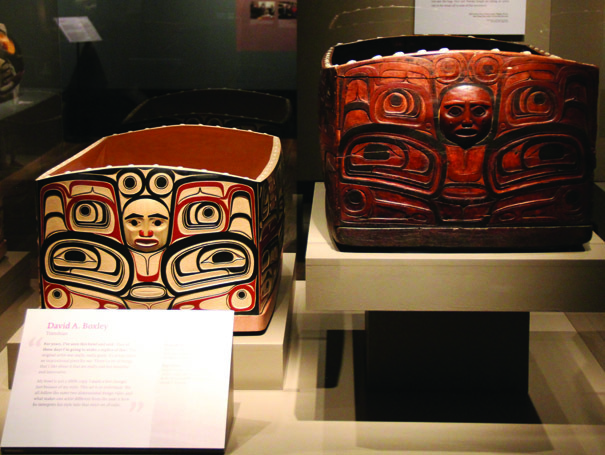 “The objects in the Burke’s collection embody the knowledge of their makers and they can be a catalyst for transferring this knowledge across generations,” explains exhibit curator and assistant director of the Bill Holm Center for the Study of Northwest Native Art, Kathryn Bunn-Marcuse. Commemorating the 10th anniversary of the Bill Holm Center, Here & Now explores the dynamic relationship between the Burke Museum and Northwest Native art, artists, and scholars. In the past ten years, over ninety grants have been awarded by the center to researchers, artists, and graduate students. The grant program is unique in its breadth, providing funding for artists to conduct workshops in their own communities, and travel funding to study collections at the Burke Museum or other institutions that hold collections key to an artist or researcher’s interests. These grantees have all contributed to the current dynamism of Northwest Native art. Here & Now shares the results of the conversations artists have with historical artworks. Celebrate master artists of the past and present and share in the enthusiasm and creativity of today’s emerging artists. The Kwakwaka’wakw transformation mask that inspired the design of the original Seahawks logo. The Mask That Inspired the Seahawks Logo: In the lead up to the 2014 Super Bowl, Dr. Robin K. Wright, Curator of Native American Art and Director of the Bill Holm Center for the Study of Northwest Native Art at the Burke Museum and Bill Holm – one of the most knowledgeable experts in the field of Northwest Coast Native art history – tracked down the origins of the Seahawk’s logo. A photo in Robert Bruce Inverarity’s 1950 book, Art of the Northwest Coast Indians depicts a Kwakwaka’wakw transformation mask which depicts an eagle in its closed form with a human face inside (revealed when the mask opens). 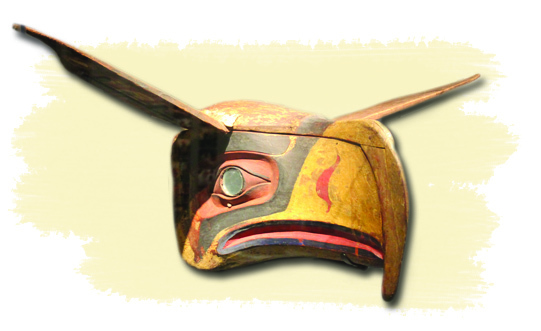 Further research revealed press articles from 1976 that described this Kwakwaka’wakw mask from Vancouver Island as the source of the logo. It is now part of the Hudson Museum at the University of Maine’s collections. During Here & Now, the mask will be displayed along with Native artists’ interpretations of the signature Seahawks design and logo. The Burke is currently fundraising through Kickstarter to bring community experts from the Kwakwaka’wakw First Nation to the museum to study the mask and for further preservation and mounting before it is put on display. To meet our goal, the museum still needs to raise about $6,000 and we are encouraging fans to donate $12 to the cause. Meet the artists of Here & Now! On Sunday, November 23, participate in a panel discussion with selected artists whose work is featured in the exhibit, Here & Now: Native Artists Inspired; and join them for in-gallery conversations about their work. See the documentary “Tracing Roots,” which offers a heartfelt glimpse into the world of Haida elder and weaver Delores Churchill, and visit with her daughter and renowned weaver Evelyn Vanderhoop. Get an up close view of tools and techniques as Burke Curator Sven Haakanson demonstrates the process of cleaning and preparing a Kodiak bear intestine for use in clothing and boat-making. About the Burke Museum: The Burke Museum is located on the University of Washington campus, at the corner of NE 45th St. and 17th Ave. NE. Hours are 10 am to 5 pm daily, and until 8 pm on first Thursdays. Admission: $10 general, $8 senior, $7.50 student/ youth. Admission is free to children four and under, Burke members, UW students, faculty, and staff. Admission is free to the public on the first Thursday of each month. Prorated parking fees are $15 and partially refundable upon exit if paid in cash. Call 206-543-5590 or visit www.burkemuseum.org. The Burke Museum is an American Alliance of Museums-accredited museum and a Smithsonian Affiliate. During the apex of Seahawks fever earlier this year, U.W. art students began researching the origins of the team’s logo. When they asked Burke Museum curator Robin K. Wright, she remembered a conversation she had with a past curator who identified the source as a photo in a 1950’s book of Northwest coastal art. After a bit more research, students found the inspiration was a photo of a transformation eagle mask from the Kwakwaka’wakw—an indigenous tribe from British Columbia. After poking around some more, the director of the Hudson museum at the University of Maine revealed that the original mask was in their collection, and are now willing to lend the mask to the Burke for display in November. The Burke Museum has launched a Power2Give campaign to pay for the conservation, insurance, and shipping of the mask. Those who donate will get an early look at the mask during the exhibit’s opening. In an emotional ceremony Monday at the Burke Museum in Seattle, the Lower Elwha Klallam Tribe prepared to transport 14 ancient artifacts to the tribe’s heritage center in Port Angeles. Arlene Wheeler, left, escorts artifacts pushed by Maurice Pitchford, 4, and the Burke’s Laura Phillips on Monday. State construction contractors inadvertently dug up parts of the largest Indian village ever unearthed in the Northwest 10 years ago this August. 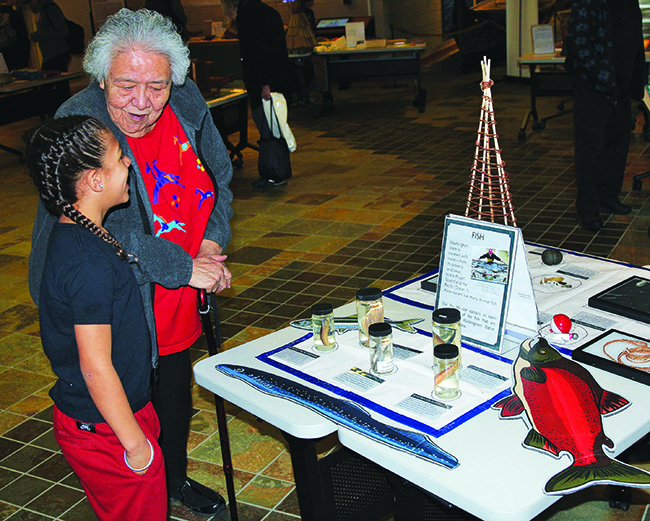 On Monday, members of the Lower Elwha Klallam Tribe realized a long-held dream, bringing some of the most spectacular belongings of their ancestors back to their home territory, for display in their own heritage center in Port Angeles. Fourteen artifacts — just a fraction of more than 80,000 recovered from the site — were handed over to the tribe after a brief, but emotional private ceremony at the Burke Museum of Natural History and Culture in Seattle, where the rest of the collection is still held for safekeeping. “This is a long time coming,” said tribal Chairwoman Frances Charles, who made the trip to the Burke with her 4-year-old grandson, along with leaders of the Elwha Drum Group and prayer warrior Jonathan Arakawa to commemorate the transfer. In a basement room with no windows, tribal members first lined up facing east, with two simple cardboard bankers’ boxes on a table before them, holding their ancestors’ possessions, dug up from their waterfront village. Arakawa called down a blessing on the gathering, and offered thanks and prayers for a historic day, finally come. Then Mark Charles, dressed in red and black ceremonial regalia, took deep breaths and focused his concentration for long moments, preparing to sing. He at last raised his elk-skin, hand-painted drum and began beating the stately cadence of an ancient song. Charles’ deep, powerful voice boomed in the small room, which filled with sound as other tribal members joined in, and raised their hands to receive the song. The objects selected by the tribe are among the most spectacular in the collection: A bone comb, carved on two sides, and found at the site virtually intact. Two blanket pins, carved in the shape of a fawn’s head, and a halibut. Seven etched stones — from more than 900 collected at the site, more than from any other village in the Northwest. The stones depict stories and teachings, and no two are alike. Also included in the collection is a net weight, and a spindle whorl carved from a single whale vertebrae that Mark Charles found during the work at the site. At the time, he said he was guided by intuition to the location. The village site was discovered inadvertently during construction of a state Department of Transportation project, which was ultimately shut down and relocated, after the discovery of hundreds of human remains, including many intact burials. With the end of the project, the money that was paying for the archaeological analysis of the site was shut off, too. So while the site was one of the biggest and oldest ever uncovered in the Northwest, with portions dating back 2,700 years, most of the collection has never been analyzed, and still awaits interpretation. The tribe has long wanted to bring the collection home, for curation at the site, which has since been covered over and secured behind a fence. Human remains disturbed during the construction project were reburied as close to their original sites as possible. The tribe has since built a heritage center in downtown Port Angeles, and will display the artifacts there. The exhibit, which will be on permanent exhibition at the heritage center, opens Saturday with a public ceremony. The fish hooks, net weights and shell midden discovered at the site document the food sources that used to sustain the village — and which are hoped to boom back, with the removal, beginning in September 2011, of two dams on the Elwha River. The hydropower dams, built without fish passage beginning in 1910, greatly diminished the river’s salmon runs, and starved the beaches at the river’s mouth for the sediment that used to be home to rich clam beds. The recovery of the artifacts and the dam-removal project — the largest anywhere in the world — are part of the cultural renewal under way for the tribe. In the past several years the tribe has built a language program to revive the Klallam language and teach it in the public schools. The tribe has published a tribal language and cultural curriculum, and its first dictionary. And as the floodwaters behind the Elwha dam receded, the tribe recovered its sacred creation site, hidden underwater for a century. A celebration of the completion of dam removal is scheduled for mid-September. Meanwhile, Charles said she hopes the trickle of artifacts coming back to the tribe will eventually become a flood, as the tribe builds a curation facility at its village site to house the entire collection. To make it happen, the tribe needs not only money, but to recover ownership of its artifacts through negotiations with the state. Charles said those conversations are beginning with Gov. Jay Inslee. As the tribe’s song filled the building, Julie Stein, director of the Burke, came to the door. She watched, clearly pleased, as the boxes were carted to the loading dock, and carried by tribal members into a waiting van for the drive back to Lower Elwha. “Ancient Shores, Changing Tides” participants in the Suquamish Museum. L to R: Janet Everts Smoak, Barbara Lawrence-Piecuch, Arvin Acosta, Carmelita Acosta, Robert Arevalo, Mariel Francisco, Enrico Cabiguen (2nd row), Mimi Cabral, Jun Cayron (1st row), Mary Barnes, Lace Thornberg. Seattle – This week, seven representatives of the Suquamish Tribe are in the Philippines. Over the course of eight days, they will visit communities on Palawan Island and learn about the archaeological history of the island, as well as its modern day challenges to preserve natural resources in the face of tremendous growth in both tourism and development. The visit is part of “Ancient Shores, Changing Tides,” a project that is part of the Museums Connectsm program, an initiative of the U.S. Department of State’s Bureau of Educational and Cultural Affairs that is administered by the American Alliance of Museums. The Suquamish delegation’s trip to the Philippines follows on the heels of a visit seven heritage enthusiasts from the Philippines made to Seattle and Suquamish this past October. 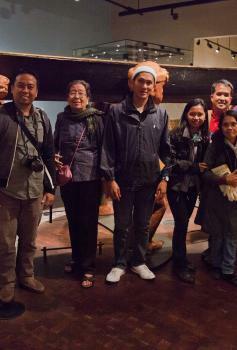 During their eight-day stay in Washington, the Filipino delegates learned about museum curation and collection practices through guided tours of several museums in the region: the Burke Museum, Wing Luke Museum, Suquamish Museum, and the Makah Museum and Cultural Resource Center. 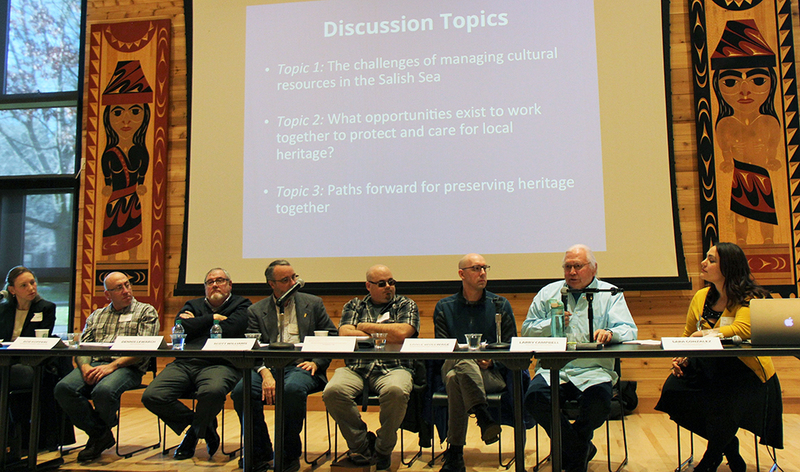 In addition to comparing their community museums, the ways in which their heritage is preserved, and local efforts to attract tourism, the Filipino and Suquamish groups are also comparing their fisheries management practices. The Filipino delegates were able to go out with Suquamish Seafoods divers to see geoducks being harvested. When they visit El Nido, the Suquamish delegates will travel through a community-managed marine protected area to see how those practices are helping fish stocks to recover in an area threatened by dynamite fishing, overfishing, and climate change. The sustainable fishing component has led to some rather delicious opportunities. At a traditional foods feast held at the House of Awakened Culture in Suquamish, more than 200 people gathered to enjoy a feast featuring locally-harvested geoducks, salmon and Manila clams. On Palawan, the delegates will be able to taste grouper, dolphinfish, anchovy, squid, crabs and more. There, locally harvested fish, seafoods, shellfish, and seaweeds will all be prepared according to traditional Cuyonon techniques. The travelers representing Suquamish are tribal chair Leonard Forsman and his wife Jana Rice; tribal elder Jay Mills; Suquamish Museum director Janet Smoak; the Suquamish Tribe’s youth programs director Kate Ahvakana; the Tribe’s grants coordinator Angela Flemming; and Tribal member Kah-ty-ah Lawrence. Travelers representing the Burke Museum are project manager Lace Thornberg, associate director Peter Lape and community relations director Ellen Ferguson. With this trip coming in the wake of super typhoon Haiyan, there is certain to be a lot of discussion between the groups about recovery efforts—and how to build communities that are more resilient to the effects of climate change. When the Filipino delegates rode the Bainbridge Island ferry back to Seattle from Suquamish, they witnessed something few Seattleites have been lucky enough to see: orcas in south Puget Sound. These majestic animals had also accompanied the ferry that was carrying Suquamish artifacts from the Burke Museum to the new Suquamish Museum the day before. Perhaps the delegates from Suquamish will be lucky enough to see a manatee – known locally as a dugong – make a rare appearance while they travel El Nido’s waters. “Ancient Shores, Changing Tides” is one of ten Museums Connectsm programs taking place throughout the country this year. The mission of the Museums Connect program is to strengthen connections and understanding between people in the United States and abroad through innovative, museum-based exchanges that address critical needs or timely issues in museums’ local communities and help museums better serve the public.